Mixed feelings invade one’s heart when you have Angular Cheilitis appear. There is embarrassment about the way in which the skin around the lips looks like and there is the feeling of fear of the way in which this condition may develop in time. Then, there is the pain which usually accompanies this condition. With so many feelings crossing their souls, many people just panic and start picking at the cracked skin, in hope that this will hurry the process of healing. Yet, this is one of the worst things you do when you have Angular Cheilitis. Angular Cheilitis involves the cracking of skin, inflammation, redness and in most severe cases infection and pus. In order for the skin to start healing, it will need to start regenerating the cells which have been damaged. Thus, more often, in the cases precursory to the healing the skin will have a flaky aspect. This means that the skin is trying to remake the areas which are affected. If you start picking at that skin and taking it from there you will further enlarge the lesions and prevent the skin from healing in an effective manner. In other words, instead of helping the skin to heal, as you may believe, you just make the process longer and more difficult. In addition to that, the hand surface collects millions of bacteria each hour. Thus, placing your hands on the affected area will further increase the risk of infection. Even though you have just got rid of all that nasty pus you can cause another infection just by picking at your sores and you do not want this to happen, right? Also, picking at your skin when you have Angular Cheilitis may result in scarring the affected area. 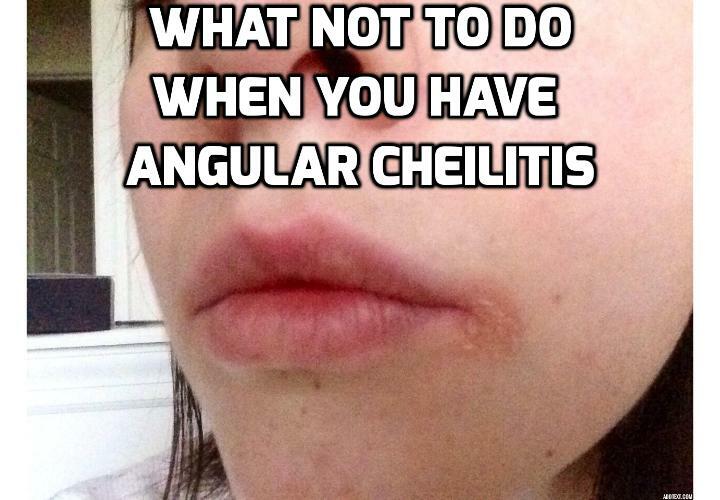 This is another reason for which you should keep your hands away from the area affected by Angular Cheilitis. The temptation of trying to ‘help’ your skin recover faster when you have Angular Cheilitis by picking at your sores may be high. Yet, you should refrain from such actions if you do not want to prolong the time it will take your skin to heal and aggravate the situation.